Abstract: Mental rehearsal is a technique used by a variety of disciplines such as sports, dance, music and public speaking in order to improve individual performance by inter-connecting the psychological and physical centres within the brain to achieve optimal performance. In the field of professional sport, athletes may work with trainers to rehearse a skill in their 'mind's eye'. This technique has been shown to improve performance, enabling the individual to anticipate problems, and to increase confidence. In healthcare, mental rehearsal has been shown to improve surgical performance . Competence in sonography relies on honing visuomotor skills ('hand-eye coordination') and the ability to scan and compare an acquired image to a visual standard . The operator also requires refined visuospatial skills; ability to visualise a 3D image from a 2D image . These skills must be executed simultaneously alongside clinical deduction from the image and moving the transducer for image optimisation. The formulaic approach that is required in musculoskeletal ultrasound and appropriate image acquisition lends itself to honing of skills through mental rehearsal. 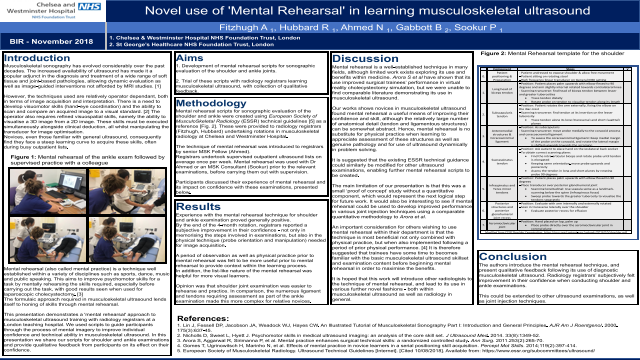 This presentation demonstrates a 'mental rehearsal' approach applied to musculoskeletal ultrasound learning with radiology registrars at a London teaching hospital. We used written scripts to guide participants through the process of mental imagery to improve individual confidence and technical ability in musculoskeletal ultrasound. In this presentation we share our scripts for shoulder and ankle ultrasound and provide qualitative feedback from participants on its effect on their performance. Summary: The authors present the concept of 'mental rehearsal' and its use in improving trainees skills in musculoskeletal ultrasoundReferences: 1. Arora S, Aggarwal R, Sirimanna P, et al. Mental practice enhances surgical technical skills: a randomized controlled study. Ann Surg. 2011.253(2):265-70. 2. Nicholls D, Sweet L, Hyett J. Psychomotor skills in medical ultrasound imaging: an analysis of the core skill set. J Ultrasound Med. 2014. 33(8):1349-52.